president of the RIBA, Royal Institute of British Architects. 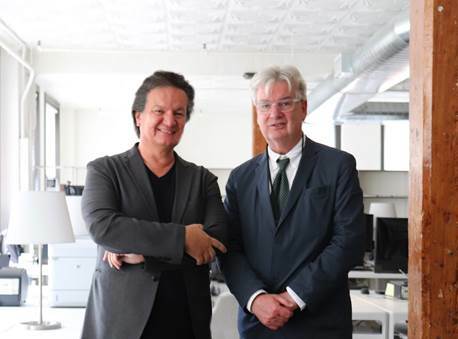 NEW YORK, NY On Thursday, June 21st, internationally renowned architect Emre Arolat, recent winner of the 2018 RIBA Award for International Excellence, presented notable examples of his work to a group of Royal Institute of Architects (RIBA) members who gathered for a luncheon at the recently opened SoHo studio of EAA – Emre Arolat Architecture. Emre Arolat presented three of his recent and current projects to the group including SantralIstanbul Museum of Contemporary Art in Istanbul, a new museum hotel currently under construction in Antakya, and the winner of the RIBA 2018 Award for Excellence, the Sancaklar Mosque, in Istanbul. During the presentation, Emre related much of his background from his early days and his desire to be a race car driver to entering architecture school, joining his parent’s firm in 1987, and then establishing EAA in 2004 with co-founder Gonca Pasolar. “I am very proud to have seen my practice grow over the years from Istanbul to London and now New York City. I believe that architecture is a realm where contextual relationships appear in their widest and deepest meanings and one where each specific situation creates its unique solution. Each project is special and deserves a unique idea, this is what we sought for while designing a hotel over the incredible mosaics from antiquity in Antakya or when we tried to go back to the essence of Islam and found ‘humility’ on which we constructed the Sancaklar mosque. Each project, each different geography and place is another attempt to find this unique idea and now working in New York, interpreting this context has been really rewarding. It is very special sharing these with the board members of RIBA and I am happy to receive such appreciation,” said Arolat. Following the discussion, the audience heard remarks from Ben Derbyshire, president of the RIBA, who spoke of the RIBA Award given to EAA for the design of the Sancaklar Mosque, presenting it as a great example of the new paradigm in religious architecture. “The Sancaklar Mosque is truly embracing nature and women as it shows the basis of spirituality and the articulation of it is absolutely beautiful. I want to emphasize how important and unique the award is now because we described ourselves as a global institute – a global membership for the advancement of architecture” said Derbyshire.